There’s no holding ambitious media agency group Aegis at the moment as it spends the proceeds of a £190m bond-raising exercise on acquisitions around the world. But a problem for the ambitious CEO Jerry Buhlmann remains its Synovate research arm which has soaked up piles of Aegis cash and is still barely profitable. Now Buhlmann has bought a majority stake in Moscow-based research firm Comcon, one of the biggest operators in Russia in a move that makes Synovate the second-biggest research operator in Russia behind WPP’s Kantar grouping. Buhlmann says that the “burgeoning middle class” in Russia will create greater opportunities for consumer research. Aegis has also been flexing its muscles in the personnel stakes, luring Saatchi Fallon EMEA boss Simon Francis to take over the same position at Aegis. Saatchi Fallon UK boss Robert Senior will take over his duties which will require a little time management on his part as he’s also head of SSF’s worldwide creative board. Earlier this year Aegis bought Australia’s Mitchell Communication media and research group for £208m shortly after buying 17.7 per cent of China media buyer Charm Communications. Buhlmann obviously sees Mitchell as the hub for the agency’s Asia Pacific activities. He’ll also be happy to see Aegis getting bigger (and acquiring more debt) because this will make it much harder for Havas boss Vincent Bollore’s Bollore holding company to mount a full takeover bid. Bollore (the company) has owned a near 30 per cent stake in Aegis for some years now. Aegis is now the only big independent global media agency, the rest all being owned by the likes of WPP, Omnicom, Publicis and Interpublic. Havas’ rather smaller flagship media brand is Media Planning Group, headed by Spanish former banker Fernando Rodes Vila. 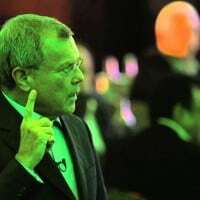 WPP’s Sir Martin Sorrell joked at the recent Morgan Stanley technology, media and telecoms conference in Barcelona that Rodes Vila and Buhlmann were tying up a deal there and then when both failed to show up on time for the start of the conference.